The client requested an eLearning solution for an audience that was historically difficult to engage. To captivate this audience, we created a highly interactive, fast-paced and engaging eLearning experience that used a “Storm Trackers” thematic as a metaphor. The purpose is to remind sales associates of the importance of updating their forecasts, and help them develop core skills necessary to identify things to look for and how to react. In this eLearning experience, the learner assumes the role of a new member on a storm tracking team and is responsible for identifying “storms” that will disrupt their sales forecast, then use principles and best practices to investigate, diagnose, anticipate and mitigate risks associated with their sales forecast. 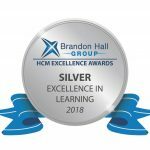 This project also won “Best Sales Training Solution” at the eLearning Guild’s DevLearn Demofest in 2017.